Sleeps 6+2 - Sleeps 6+2 Ocean View is a quirky and impressive double fronted Grade II listed stone property located in an elevated position on High Barrass with sea views from most of the rooms. Ocean View was fully upgraded in 2018 with improvements to both the interior and exterior of the property. There is an impressive lounge on the ground floor with stripped ceiling beams, floorboards and original wood panelling. Loads of space to relax to watch TV or a DVD reclining on the L shaped sofa or in the one of the large armchairs set by the fireplace. All the bathrooms and ground floor cloakroom are modern and benefit from a pressurised hot water system. The kitchen/diner is located on the top floor to maximise the awesome panoramic views of the harbour and North Sea beyond. There is a mixture of thermostatically controlled electric heaters and underfloor heating throughout the cottage plus an open fire on the ground floor. We provide a complimentary initial supply of logs and kindling October to April inclusive. Free Wi-Fi access. The cottage can comfortably accommodate 6 adults plus 2 additional guests (max age 14). The sofa on the ground floor can be used as a double sofabed with an additional charge of £10 per night. The internal staircases are steep and may not be suitable for people with mobility issues. 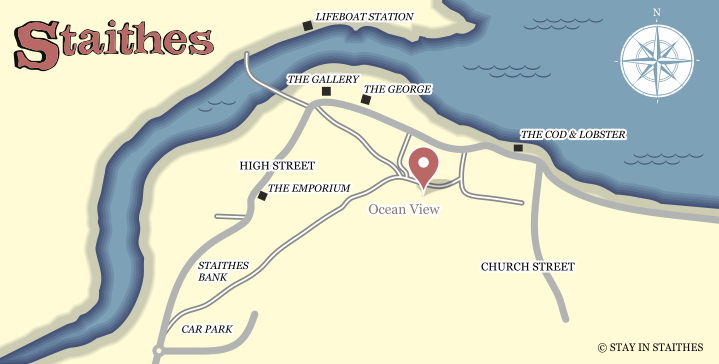 Ocean View is situated on High Barrass just off the main High Street and is only a short walk to the harbour, local pubs and village amenities. Short term parking is available in the High Street for unloading and the main car park is a 5-10 minute walk from the cottage. We provide two parking permits when charges apply March to October inclusive. Please note that access to the front door of the cottage is via a set of stone steps. Ground Floor – double fronted living room with working feature fireplace, original wood panelling, exposed beams, L shaped sofa (can be used as double bed – additional charge applies) and two large armchairs; TV, DVD and Bluetooth music speaker. Partial sea views to the front of the property. Cloakroom with toilet and sink, heated towel rail and storage for coats etc. Lower Ground Floor – steps lead down from the living room to bedroom 1: twin bedroom with chest of drawers, TV and DVD player. Door through to lobby area with en-suite wet room, separate WC/basin with heated towel rail and underfloor heating throughout. Door leads off lobby area to utility room with washer/dryer, fridge and freezer for additional food storage. There is also an outside access door to the front of the property from the lobby area. Please note that there is restricted headroom throughout this floor. First Floor – bedroom 2: double bedroom with en-suite shower room, built in wardrobe space, original panelling, original sash window with great sea views. Bedroom 3: double bedroom with amazing views of Staithes harbour and original panelling/feature fireplace, alcove wardrobe/shelving. Spacious and modern house bathroom with large bath, separate walk in shower, toilet, sink, heated towel rail and underfloor heating. Second Floor – the well-equipped kitchen/dining area has with one of the best views in Staithes. This is the perfect place to enjoy a meal and a glass of wine with friends and family. Dining table seating 6 and 2 additional stools at the breakfast bar. Double oven, halogen hob, dishwasher, larder fridge with freezer compartment and microwave. Outside – stone steps lead up to the front door of the house and there is a bistro table and two chairs from which to enjoy the sea views across the roof tops.